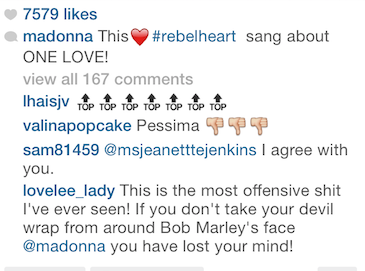 When I stumbled across a post from Madonna Instagram‘s page, it was a picture of Bob Marley‘s face loosely wrapped by a taut black band, which is also how Madonna looks on the cover for her latest album Rebel Heart. 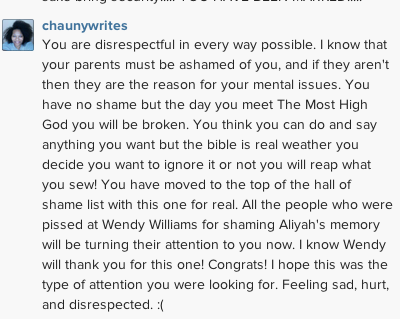 I was a tad shocked, but not as pissed as some of her followers were, who already took it upon themselves to debate whether or not this was appropriate. 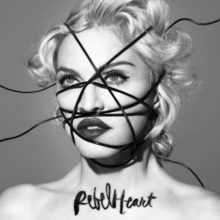 I then clicked on the icon’s page and saw that Nelson Mandela and Dr. Martin Luther King, Jr. were too similarly “appointed” as rebel hearts with those sprawling black bands. Madge has been posting re-imagined or remade images of her album cover for weeks now, including one from Miley Cyrus, and a parody with Homer Simpson. Though she meant to honor these deceased heroes of freedom, peace, and justice, did she take it too far again? What do you think? 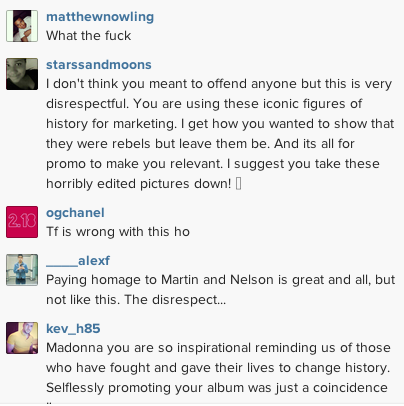 This❤️#rebelheart sang about ONE LOVE!